Hello, I just got in the new Xiom Vega DEF in Max. They also offer it in 2.0mm, but were out of stock. After reading a review of it on TTD i was intrigued. It's supposed to be very grippy and very good at service. Lower gears, but not too chinese-like, and with a hard dense sponge. 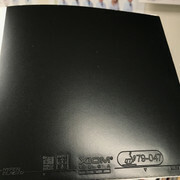 After opening the package, the sponge is indeed dense and hard. To the touch, it is one of the hardest sponges I've felt, but somehow feels "rubbery" for lack of a better term. The hard chinese sponges like hurricane, are more brick-like or rigid. This is hard, but bendy...you'd have to really experience it to understand. I can hardly see any of the pores within the sponge, and in-fact it looks more solid than not. Very cool looking. It's definitely harder than V>401. Probably on par with H3. I'll have to check side by side later on. 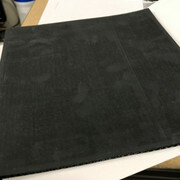 The top sheet has smallish pips, but still somehow feels elastic. The topsheet will definitely be mechanical grip...and it just seems grippy to the touch. 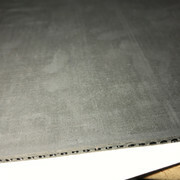 When I compress the rubber, it's the topsheet that has some give, and the sponge less so. I would not call the topsheet soft, but it's softer than hurricane for sure, and NOT tacky. 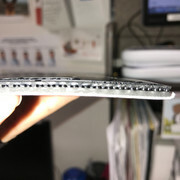 I suspect this to be unique feeling, something like a bendy/grippy topsheet, but with a hard sponge, I can't think of another rubber that seemed like this out of the package. I will be playing with it tonight and can give you my impressions later...from a 1600 level chopper's perspective. 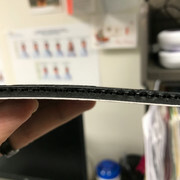 What were your thoughts on this rubber? Ridderz is an insufferable ej... like the rest of us! I've been using the 401 and mx-s, which I imagine are all pretty similar to this. I started a few years ago using 401 in 2mm then down to 1.8 then 1.5 loved it but just lacked something could not really work out what! 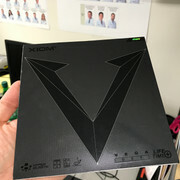 As I am NZ dealer for Xiom I got them to send me a free sheet to try, but i will have to admit I had it for along time before i did try it, and going from 1.5 to max ( the only thickness they actually make they told me -- too small of a market ) and loved it. My loop has away been spiny but not that fast so I just slap a few more now works well. I've wanted to try this rubber for a while, but XIOM only seemed to ever stock it in MAX, whereas you'd think that the majory of defensive players (for mere mortals like us, not the elite players) would probably prefer something thinner. but really i went from 1.5 to max no issues, have you got a sheet to try ? I can bring you a free one in Oct at Aussie Vets? Oh I wanna try it too. 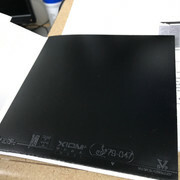 I use Joo blade and Diode V. Do you think this rubber will match up well with my blades?